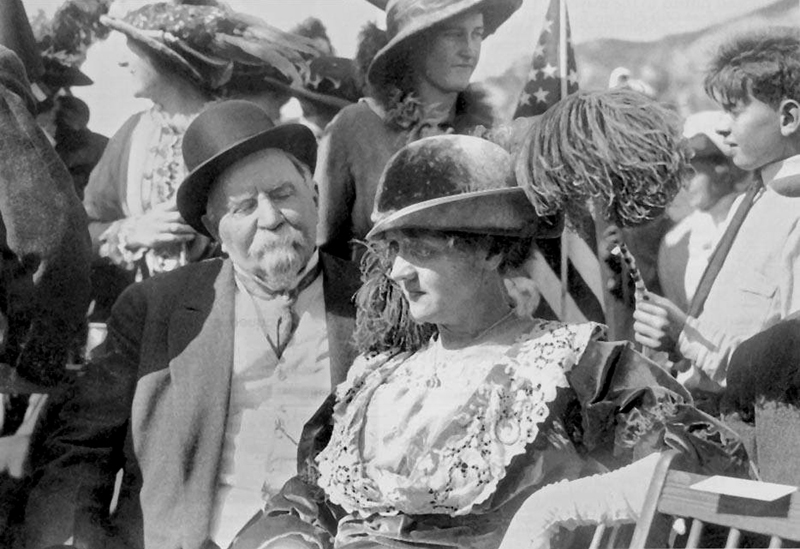 Los Angeles Times Publisher Harrison Gray Otis and singer Ellen Beach Yaw, aka Lark Ellen, at the grand opening of the Los Angeles Aqueduct in the San Fernando Valley (Sylmar), Nov. 5, 1913. According to photo contributor Paul H. Rippens, Yaw sang "Hail the Water" at the opening ceremonies. The words are: "Lift your voice in gratitude / A river now is here / Whose glorious waters flowing free / A paradise will rear. Here within this land of love / May peace forever reign / For God has brought us waters pure / That Eden we regain." Ellen Beach Yaw (b. Boston, N.Y., Sept. 14, 1869; d. Covina, Calif., Sept. 9, 1947) was a concert singer of extraordinary range. After studying music in Boston, New York, and Paris, Miss Yaw made her concert debut in St. Paul, Minn., in 1894. Tours of the southern United States, England, Switzerland, and Germany followed, and on her return to America she gave a concert in Carnegie Hall in 1896. Known as "Lark Ellen," she could produce remarkably high notes, and was reportedly the only known soprano who could sing and sustain D above the high D. In 1899 she so impressed Sir Arthur Sullivan that he prevailed upon the D'Oyly Cartes to cast her as the Sultana Zubedyah in his comic opera The Rose of Persia, which opened Nov. 29, 1899, at the Savoy Theatre. Sullivan went so far as to write a special cadenza for her song "'Neath My Lattice," a cadenza that only she could sing. Miss Yaw's first few nights were shaky, though the reviews were mixed, and Mrs. Carte began pushing for her replacement. Sullivan at first agreed, but by Dec. 10 wrote in his diary that she was "improving rapidly" and "sang the song really superbly, brilliant." It was too late, however, and the next day he learned to his consternation that Miss Yaw had been dismissed by Mrs. Carte, and replaced by Isabel Jay. Miss Yaw rarely appeared on the dramatic stage thereafter. Aside from a few grand opera appearances in Rome and Milan, and a single performance of Lucia di Lammermoor at New York's Metropolitan Opera (March 21, 1908), she devoted herself to the more congenial (and remunerative) concert hall. She was also much in demand as a recording artist, her first records being made in May 1899. In order to display her voice, she wrote several songs of her own with titles such as "The Skylark," "The Cuckoo" and "The Firefly." Madame Yaw resided in West Covina, California, for the last thirty years of her life. She taught singing, gave concerts, and devoted herself to charitable pursuits. She established the Lark Ellen League to give concerts in hospitals, homes, and jails; and the Lark Ellen School for Boys, later taken over by the Lions Club. Miss Yaw is memorialized in West Covina by Lark Ellen Elementary School and Lark Ellen Avenue, one of the main thoroughfares in her hometown.